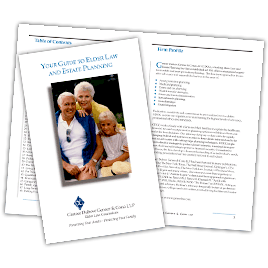 Genser Cona Elder Law (Genser Cona) has an ongoing commitment to achieving the highest levels of satisfaction for all aspects of its clients’ and the public’s online experiences. As part of these efforts, Genser Cona is dedicated to offering a quality online experience at its website genserlaw.com (the "Website") to clients with disabilities that is full and equal to that provided to clients without disabilities. To assist in achieving the aforementioned accessibility goals with respect to the Website, Genser Cona has committed to the Website being designed, developed, and operated in substantial conformance with generally recognized and accepted guidelines and/or standards for website accessibility (the "Standards"). While these Standards may change and/or evolve over time, they are currently the World Wide Web Consortium’s Web Content Accessibility Guidelines 2.0 at Levels A and AA ("WCAG 2.0"). Working with experienced accessibility consultants, including the National Center for Accessible Media at WGBH ("NCAM"), Genser Cona has been continuing to take the steps necessary to achieve substantial conformance with WCAG 2.0. NCAM is providing training to necessary individuals on an ongoing basis regarding accessible website design and maintenance. Furthermore, our Website will continue to be assessed on a recurring basis from both an engineering and user-experience basis, including the use of assistive technology (such as screen readers and screen magnifiers), and the involvement of users with disabilities who use such assistive technologies. Please be aware that our efforts are ongoing. If, at any time, you have any specific questions, feedback, or concerns about the accessibility of any particular Web pages on genserlaw.com, please contact us at elder@genserlaw.com. If you do encounter an accessibility issue, please be sure to specify the Web page/URL in your email, and we will make all reasonable efforts to address your concerns.